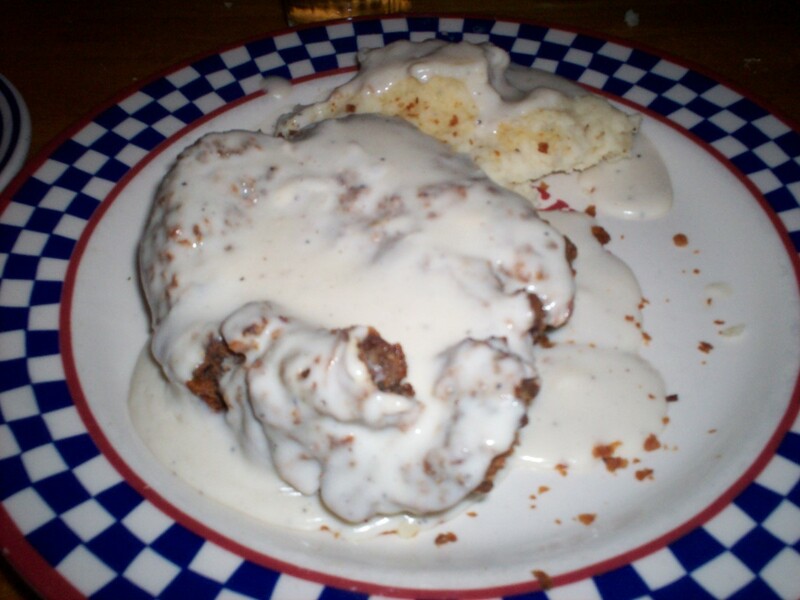 Our 2009 Road Trip, Part 23: 300 Miles from Steak to Cake « Midlife Crisis Crossover! 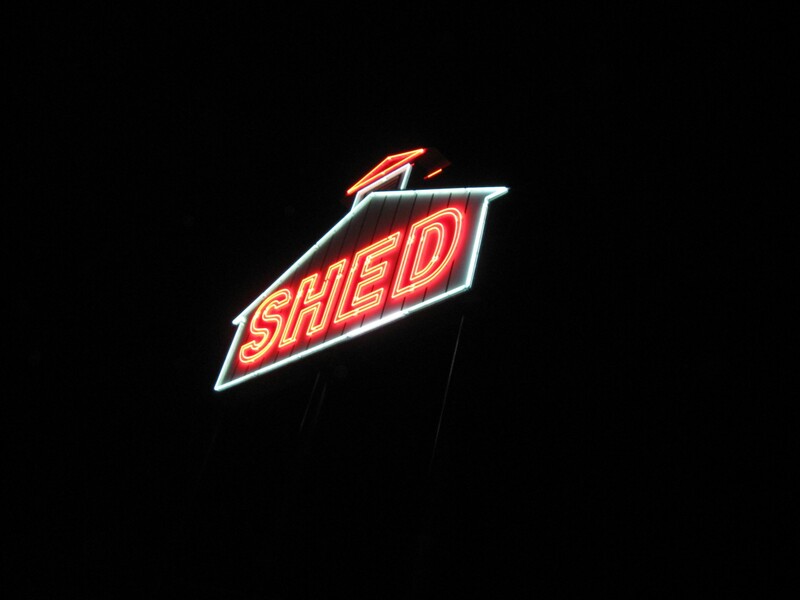 WELCOME TO SHED. YOU COME HAVE FOOD, NO, NOT TOOLS. THAT IS OTHER KIND OF SHED. It all comes down to this: the last leg of our long, long trip. We began with friends; we concluded with family. 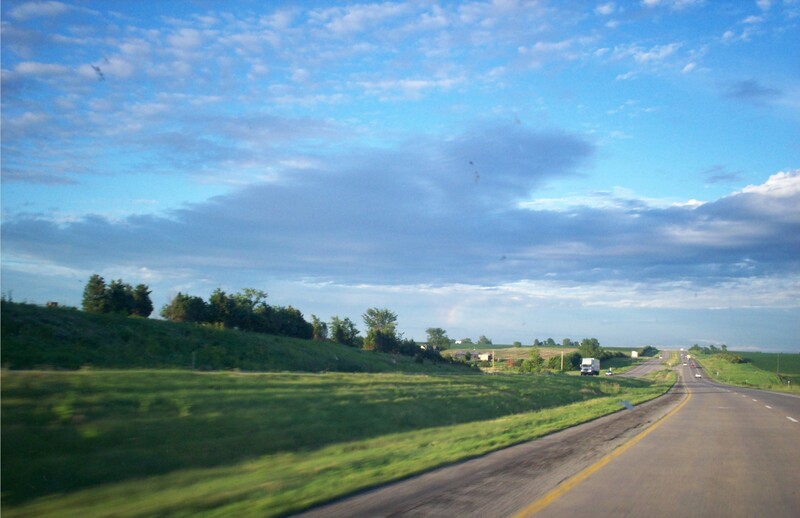 It’s no Black Hills, but Iowa is a bit more pleasant when the interstates aren’t flooded. After bidding farewell to Riverside, Iowa, possibly forever, we journeyed back to I-80, which by this time was less sunken and much less crowded. Despite the removal of all those obstacles, we still didn’t reach our lodging in Davenport till after 7 p.m. We were too exhausted to pay attention to the huge intimidating biker party out front. 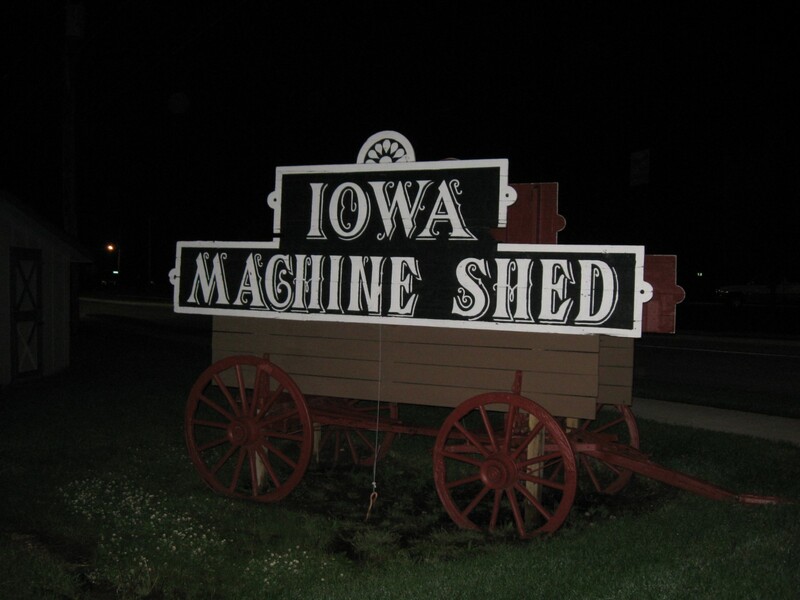 We checked in, then headed over to the Iowa Machine Shed, a restaurant genuinely As Seen On TV. The name sounds like a used farm equipment store. First impressions don’t help. Life-sized diorama boasts State Fair chic. 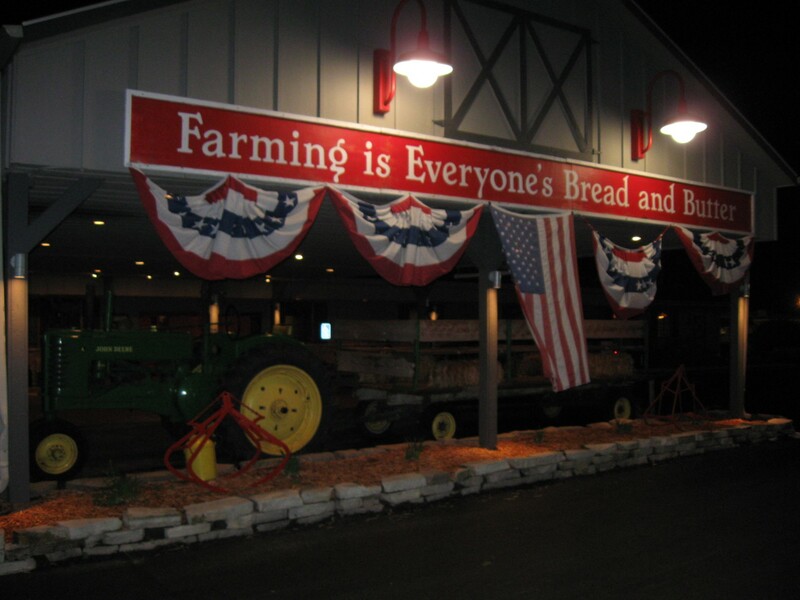 Anne has a knack for running into food-based shows on basic cable, and just happened to catch the Machine Shed on an episode of the Travel Channel’s Food Paradise. Their segment had promised us cinnamon rolls the size of our heads. The Shed was still open for dinner, but it was now 8 p.m. Their cinnamon rolls were a breakfast-only item. Alas, their neon sign taunted me with giant-snack denial like a seedy Vegas casino handing out endless jackpots of empty promises. …yeah, that neon sign in our lead photo wins. I wish I could say we ate there the next morning before departure, but we had a very important date to keep in Indiana. We were no longer willing to place any more trust in Iowa’s roads, establishments, and schedule accommodations. We’d had more than enough of gambling, whether in sightseeing or on our planning. Nevertheless, we made the most of the evening menu, which was merely hearty as opposed to gargantuan. One peculiar thing that happens to us frequently in restaurants is that I’ll order something that sounds interesting but comes in surprisingly small portions, whereas Anne will order a standard-issue foodstuff you can buy at any given restaurant, but it’ll come in a colossal portion that would sustain her on a desert island for a month. Same thing happened here: I ordered some chicken dish with a froufrou name that I inhaled within 5-7 minutes in between scant drink refills; she ordered chicken-fried steak and received the following pile of pounds drowning in sweet, luscious gravy. Just add rich, creamery butter and serve. She could only stomach a third of it before she surrendered and had the leftovers packaged up for travel. We returned to our hotel and tried to fall asleep as quickly as possible, with mixed results. The TV had more channels than any other we’d tried that week, but the most interesting thing on TV was a Spanish-language dubbed version of the Sham-Wow guy’s Slap-Chop infomercial. DAY NINE: Saturday, June 20th. Next morning, with little time to spare we packed up and sped away, forsaking the free continental breakfast in favor of quicker fast food via a McDonald’s drive-thru somewhere past Moline. 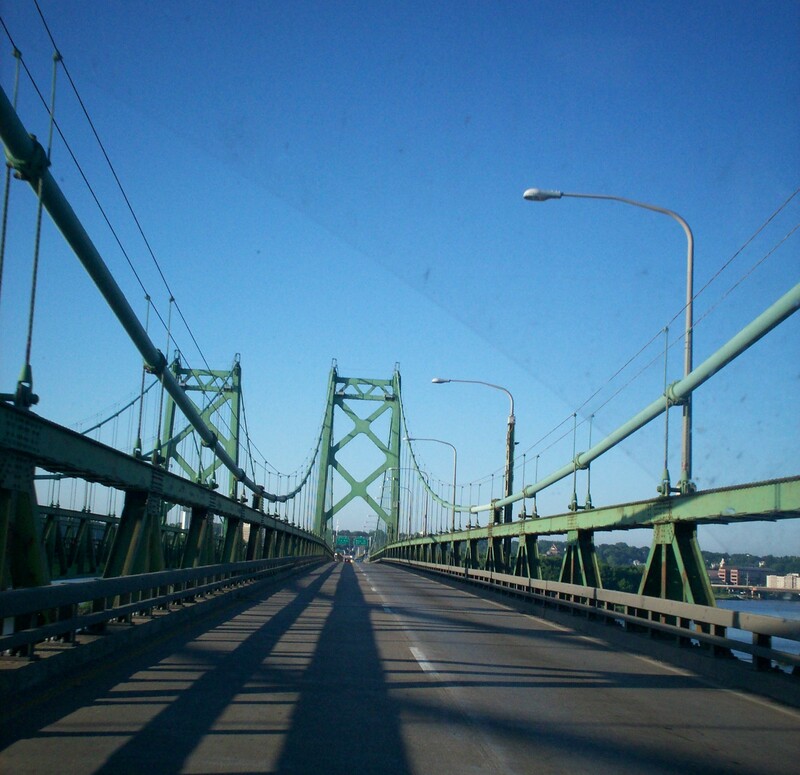 We had somewhere to be in six hours, further jeopardized by a detour I had to take around the eastern half of the Quad Cities due to Mississippi River bridge construction. Iowa has all kinds of serious, embarrassing waterway issues. 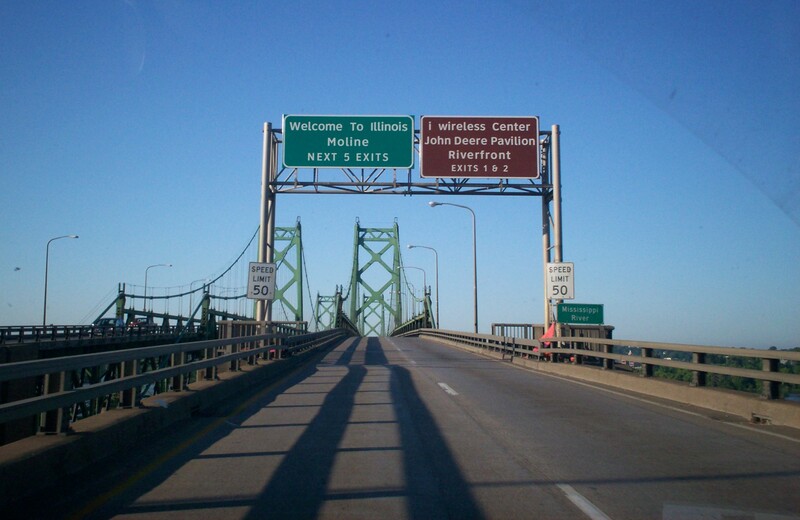 Once we escaped Iowa, our path through Illinois was a harmless one — no rain, no road construction, no flooding, no roving hordes of elderly drivers, no horse-drawn buggies, no surprise Saturday morning accidents. Our old friend the Mississippi River lay down below. No time for visiting or dipping our toes, though. Sometimes it feels weird to drive through parts of Illinois that aren’t Chicago. We reached Indiana with plenty of time to eat lunch. Had we known the day would be so kind, we could have actually eaten at the Machine Shed for breakfast. It was hard not to be disappointed in hindsight. 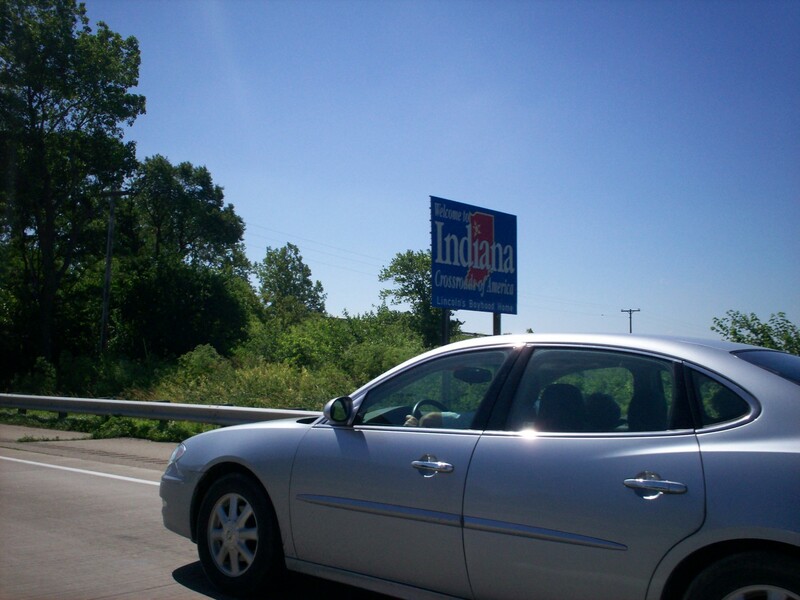 Another addition to our annual “Welcome to Indiana” photo archive. 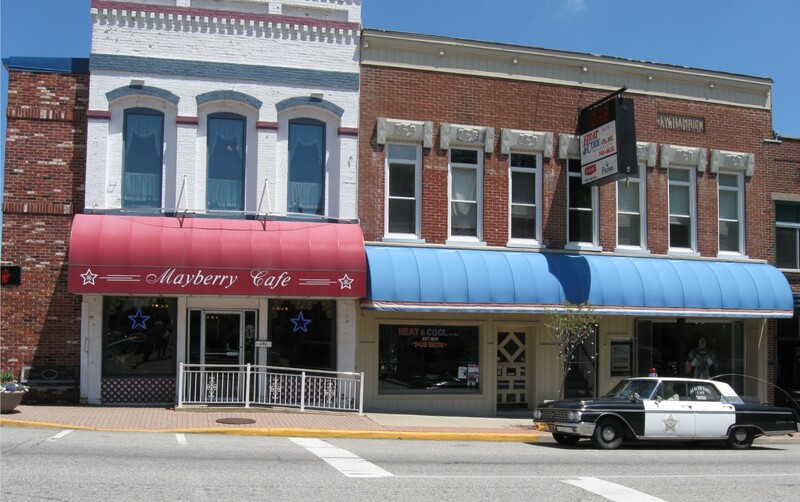 For consolation and thematic closure, we stopped for lunch at a local tourist-attraction eatery in nearby Danville, IN, called the Mayberry Cafe. A ’60s-era police car is on yearlong stakeout in front of its quaint building, inside which you’re greeted with all manner of Andy Griffith Show memorabilia and merchandise — Aunt Bee’s cookbooks, cast photos and autographs, copies of the game of Mayberryopoly, and more! The show never filmed in Indiana. Jim Nabors used to sing at the Indianapolis 500 every year. Otherwise, though, the owners are just really big fans. We elbowed our way through a crowd of senior citizens holding their 50-year high school reunion (I can’t fault them for this logical choice of venue) and settled down for some nice home cookin’, ordered from the Mayberry-themed menu selections. They’re normal dishes, by and large. No tomatoes shaped like Opie’s head or anything like that. 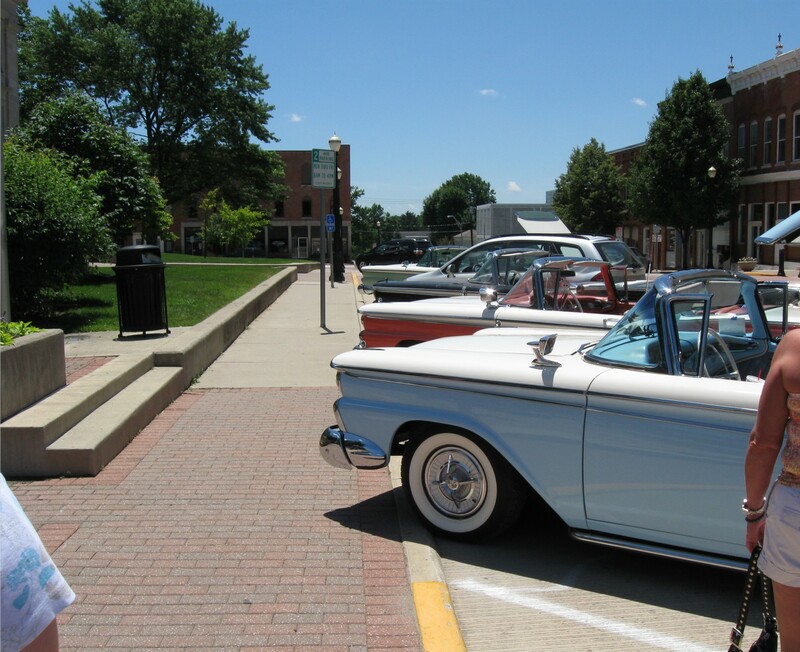 Meanwhile outside: classic cars! Danville was having that kind of weekend. Beyond Danville lay our afternoon destination, the grand finale of our vacation: Anne’s cousin’s wedding. We tried not to wish grievous harm upon him or his fiancée when they announced their wedding date would also be the last day of our vacation. We couldn’t just change our dates, especially not with Anne’s restrictive employers. That one unavoidable schedule conflict required everything we’d been planning up to that point to be reworked to ensure that that one last moment would be included, no matter what, non-negotiable. It not only meant deleting large portions of Iowa from our to-do list, it also meant reversing our entire original itinerary from finish to start, just to get the drive times to work out in our favor. We also had to devote luggage space to some wedding-appropriate outfits alongside our T-shirts and shorts. Fortunately Avis had upgraded our rental to a Kia minivan without asking, so storage space became a non-issue. 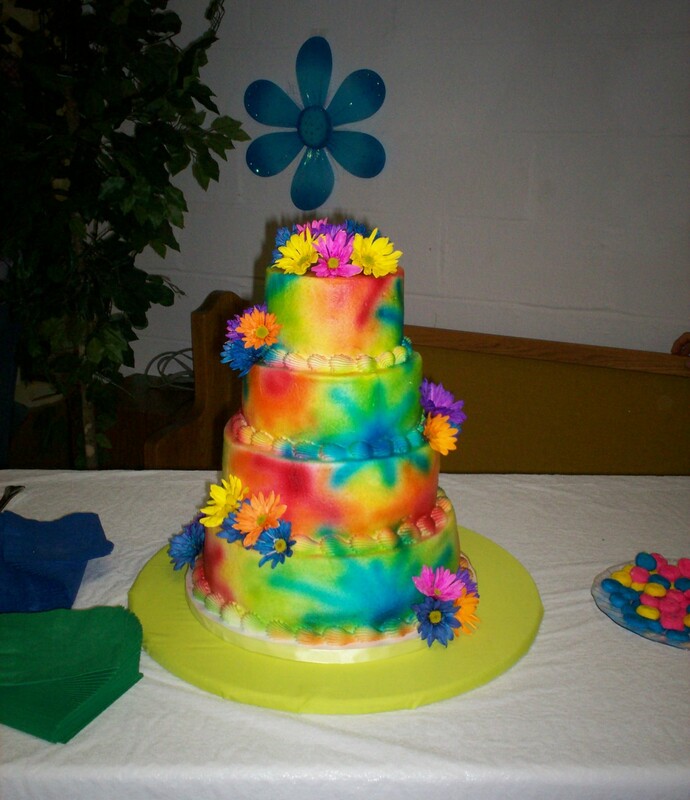 Thus we ended our 2009 road trip with one last memorable sight to behold: the most psychedelic wedding cake we’ve ever seen in person and without Googling. It wasn’t atop a restaurant roof, or parked in front of a state park, or hidden behind a cheap velvet rope, or attached to a casino. For the bride and groom, it was a different kind of monument. No, we can’t give you directions to come see it. This grandiose dessert was a temporary art installation. After their thing was over with, we went straight home and did boring things related to unpacking and collapsing. I no longer remember which came first. To be continued. Coming soon: the outtakes!